Potable water service: Distribution of potable water through pipes distributed throughout the urban zone as well as some outlying districts. Garbage collection service: Collection of trash in a truck on Mondays, Wednesdays, and Fridays. Public lighting service: Maintenance of street lighting in the urban area. Registry of Family Affairs: Inscription and expedition of certificates of birth, marriage, death, and divorce, and wedding announcements. 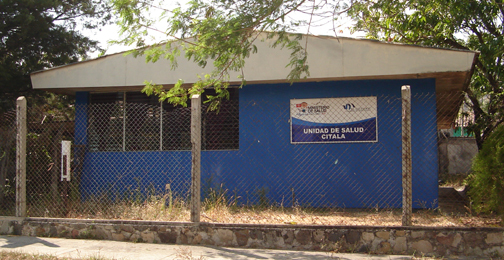 Institutional Purchasing and Contracting Unit (UACI): Development of projects to provide for the necessities of the town of Citalá. Registry of Land and Property: Department charged with looking after the control of property and businesses found within the municipality, which are subject to municipal taxes. Current Accounts: Charged with controlling charge accounts, whether for services (lighting, pavement, trash collection, etc.) or for municipal taxes (businesses), obtaining the corresponding information from the Registry of Land and Property.